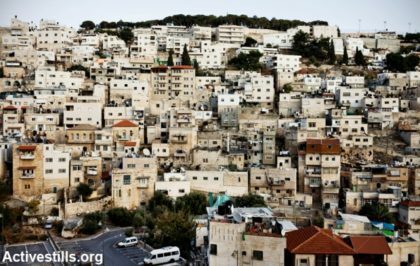 A Palestinian family from occupied East Jerusalem was notified on Monday that their home will be awarded to illegal Israeli colonialist settlers. According to a statement by Wadi Hilweh Information Center in Silwan (Silwanic), an Israeli court informed Mariam Abu Zuweir that she and her children must leave their home by March 31, 2019 . The Information Center also noted that the Israeli settler group that petitioned the court to grant them ownership of the home presented false documents in their petition. Nihad Siam, the owner of the home of Mariam Abu Zuweir, living there with her four children, has been contending with Israeli courts for more than 22 years to maintain ownership of her inherited home. Silwanic revealed that the eviction notice was issued after a petition from El Ad group, an Israeli establishment that advocates for construction of illegal Jewish-only colonies in East Jerusalem. The El Ad group allegedly presented false documentation to claim ownership, Silwanic added. The Center said that Nihad Siam plans to appeal to the Israeli High Court to stop the eviction. But that appeal will likely not stop the Israeli authorities from forcing the family out of their home, while waiting on the appeal.